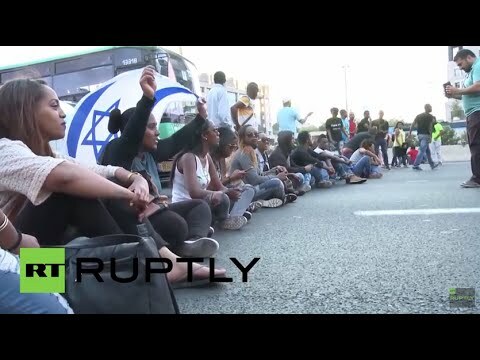 Several thousand people, mostly hailing from Israel’s large Ethiopian population, took to the streets of Tel Aviv on Sunday to protest racism and police brutality against ethnic minorities. The protest was sparked by the release this week of a video which shows an Ethiopian-Israeli man in an IDF uniform being beaten by police. Demonstrators are demanding an investigation into the attack and are calling for an end to what they say is an epidemic of brutality against Israel’s minority populations. During a similar protest in Jerusalem on Thursday night police reportedly unleashed tear gas and stun grenades against demonstrators. As the crowd continued to swell on Sunday, the Times of Israel reported that police are threatening to use force. Police estimate that crowd may grow to 5,000 people. There is a live stream of the demonstration and the Times of Israel is maintaining a live blog as the day’s event unfolds.